I added this book to my library of ceramics books a couple of weeks ago. It’s written in the form of a children’s book with beautiful collage images and is chock full of technical information. 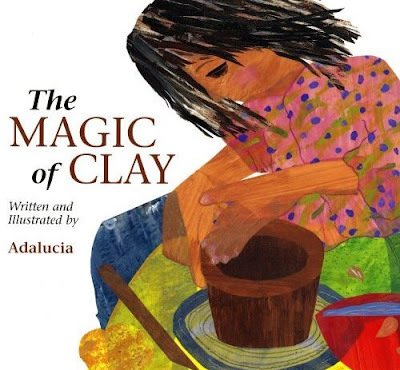 The Magic of Clay by Adalucia Quan covers a wide variety of topics: where clay comes from; the chemical make-up of clay; varieties of clay; potter’s tools; wedging; slip & oxides; the stages of clay; types of firings; pyrometric cones, etc… All the fundamental information that ceramic artists (students, amatuers and professionals alike) should know about.